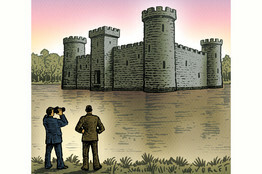 Five "wide moats" give corporations a competitive advantage, according to a recent Wall Street Journal article titled, "Follow the Buffet Strategy." While reading the article, it occurred to me that law firm marketing partners can gain some valuable insight by borrowing these investment strategies from the Oracle of Omaha. Here is a quick recap. Competitive Advantage #1: A service becomes increasingly valuable as more people adopt it. In the legal market, Skadden Arps comes to mind from a historical perspective. During the corporate raids of the 60's and 70's, clients put Skadden on retainer just so they would not be on the wrong side of a proxy fight or hostile tender offer. The bankruptcy practice of Weil Gotshal is a current example. Competitive Advantage #2: Customers lack incentive to embrace a competing product. Satisfied clients have little reason to take their business elsewhere. Of course, in today's economy cost savings can be a compelling incentive to shop around. Competitive Advantage #3: A virtual monopoly or control of a limited market can be a third type of moat, such as an airport-services provider would command. While it is unlikely that a law firm enjoys a monopoly, a highly specialized white collar criminal defense attorney or a land use and zoning attorney in a concentrated geographic area may enjoy the benefits of focusing on a narrow niche. Competitive Advantage #4: Proprietary brands, patents and licenses that create consistent cash flow. An insurance defense law firm that figures out how to get on an insurance panel of approved counsel can tap into a long-term revenue stream. The dynamics in this market are changing as panels are consolidated and management is centralized, however, which is why the firms that can get on multiple litigation panels are in a particularly strong position. Competitive Advantage #5: And a final advantage is pricing, or the ability to sell a better product cheaply, generating higher profit margins. As corporate clients shop around for alternative billing arrangements, the law firm that can lessen their reliance on the billable hour model by outsourcing some functions that can be performed with technology and/or non-lawyers rather than a higher priced associate will be rewarded. Law firm marketing strategies are complex and multi-faceted, particularly for firms with many practice areas. Focusing on key strategic benefits such as those outlined above will help a firm survive these challenging times. Contact us to discuss these and other legal marketing ideas for your law firm.